Andy Pelletier | McGinty Music, LLC. Andrew Pelletier is a soloist and Grammy-award winning chamber musician regularly performing across the United States. Of his solo playing, John Henken of the Los Angeles Times wrote, “gleaming, handsome playing. Pelletier is a soloist who seems capable of anything on his instrument.” He is the first prize winner of the 1997 and 2001 American Horn Competition (America’s only internationally recognized competition for the horn) and has appeared as a soloist at the International Horn Society Annual Symposia in 1997, 2003 and 2005. He is in regular demand for artistic residencies and clinics at universities and music schools and his solo tours have taken him to 20 US states, Quebec, Canada, Mexico City, Mexico and Shropshire, England. An active chamber musician, he is a member of Southwest Chamber Music, with whom he won the 2005 Grammy award for Best Classical Recording (Small Ensemble). As an orchestral performer, he is the principal horn of the Michigan Opera Theatre at the Detroit Opera House and the Ann Arbor Symphony, and has performed as principal horn for the Santa Barbara Symphony, Ann Arbor Ballet Theatre, Michigan Symphonietta, Columbus Bach Ensemble, Long Beach Camerata, Maine Chamber Ensemble and Portland (Maine) Ballet. A regular performer with the Toledo Symphony, he has also performed with the New West Symphony, Portland (Maine) Symphony and Portland Opera Repertory Theatre. He spent over seven years as an active free-lance performer in Los Angeles and can be heard on film soundtracks such as Lethal Weapon 4, The X-Men, Frequency and various television movies for Lifetime TV and the Sci-Fi Channel. 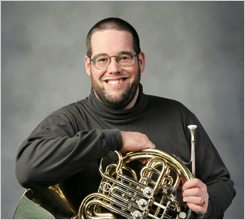 His pedagogical articles have been published by the International Horn Society and the New York Brass Conference. He holds a B.M. degree from the University of Southern Maine, and an M.M. and the D.M.A. from the University of Southern California. His primary teachers are John Boden, James Decker and trumpeter Roy Poper. He has recorded for MSR Classics, Cambria Master Classics and Delos labels. Pelletier serves as the Assistant Professor of Horn at the Bowling Green State University College of Musical Arts, in Bowling Green, Ohio.